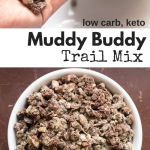 Muddy Buddy Trail Mix makes the chocolaty peanut buttery goodness of the famous Chex Muddy Buddies low carb, grain free, and sugar-free. I’ve seen recipes floating around for making this with pork rinds but I am not that adventurous. Using nuts and coconut seemed much safer. If you are not a coconut fan you can make this with all nuts BUT you really can’t taste the coconut that much. The chocolate and peanut butter hides a lot of the coconut flavor. 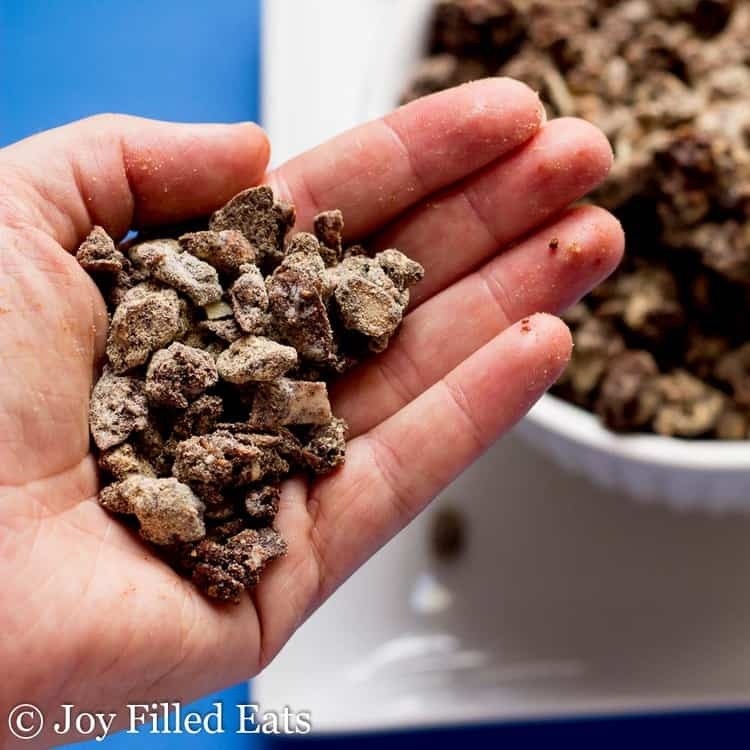 I’ve loved Muddy Buddies since I was a teenager. One of the boys would show up to youth group with two gallon-sized Ziploc bags full. I thought his mom was amazing. I had no idea how simple they were to make. There were many youth group nights that I would eat that deliciousness by the handful. 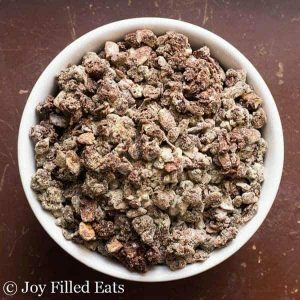 I took the classic melted chocolate and peanut butter Chex topping and made it sugar-free and then poured it onto a mix of nuts and coconut. It has the flavor and the crunch of regular Muddy Buddies but none of the grains and a lot less of the carbs. I used to store this in a huge tupperware container in the fridge but recently I’ve been portioning out single servings instead. They are easy to grab when walking out the door and that way I don’t eat a pound of nuts in one sitting. I store this in the fridge but it is fine to leave it at room temperature for a few days. Sometimes after making it I divide it into small baggies so I can grab one and go. And the help with portion control. 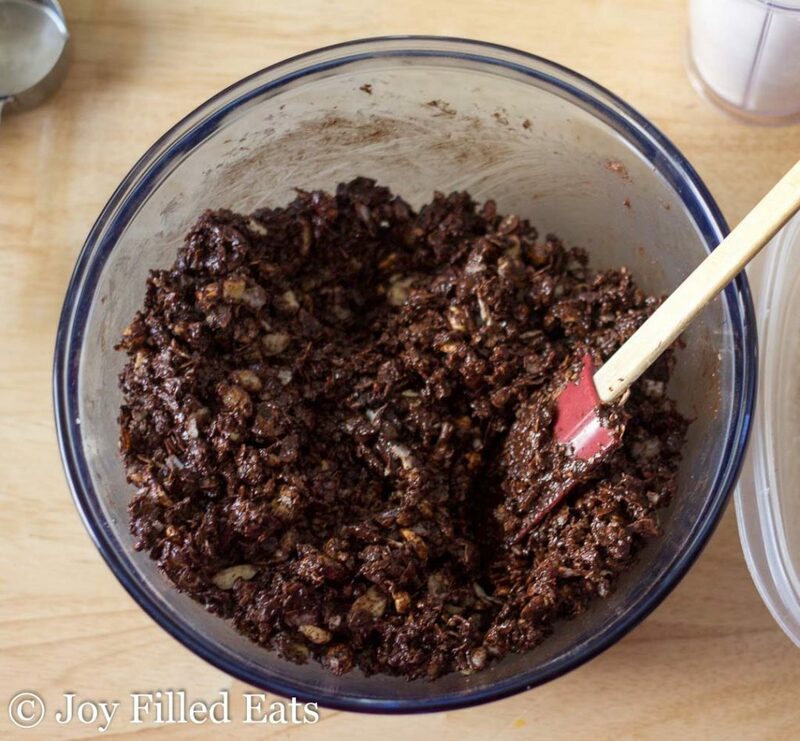 In a medium bowl melt the chocolate and the butter or oil in the microwave. I melt chocolate in the microwave stirring every 30 seconds. You can do this on the stove top over low heat if you prefer. Stir in the peanut butter, vanilla, and sweetener. 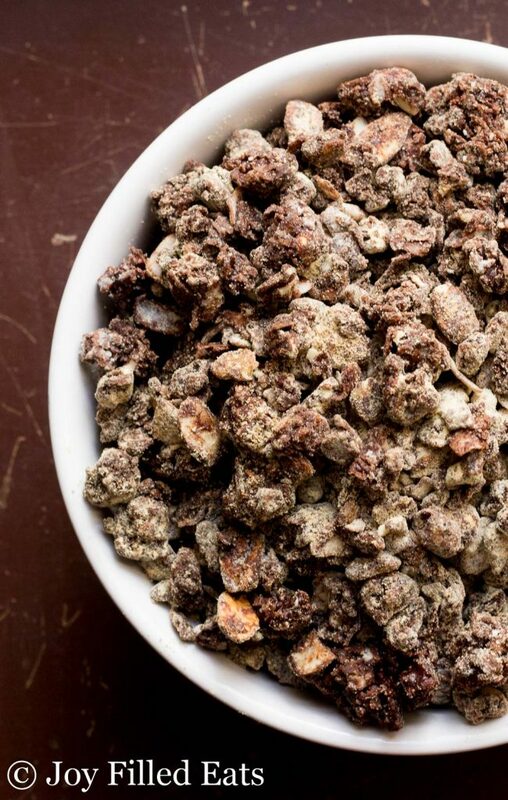 In a large bowl mix the nuts and coconut. 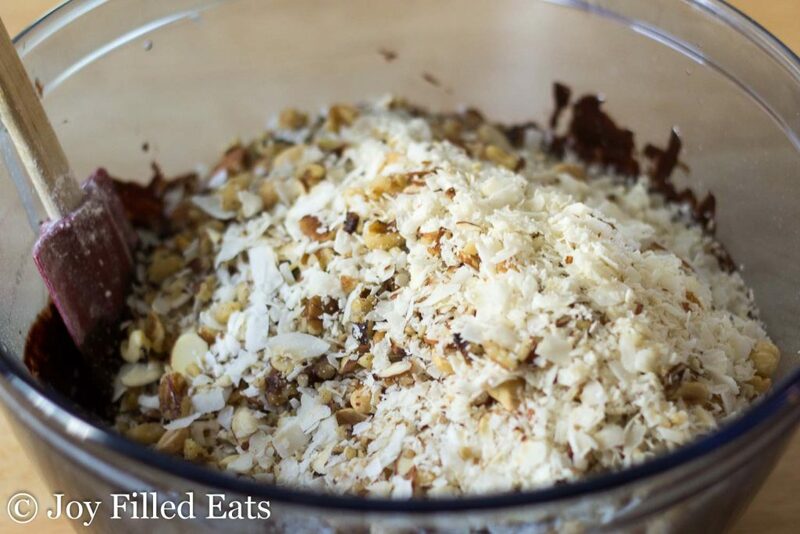 Pour the chocolate mixture over the nuts and coconut. Stir well. Spread onto a large baking sheet lined with waxed paper or parchment paper. 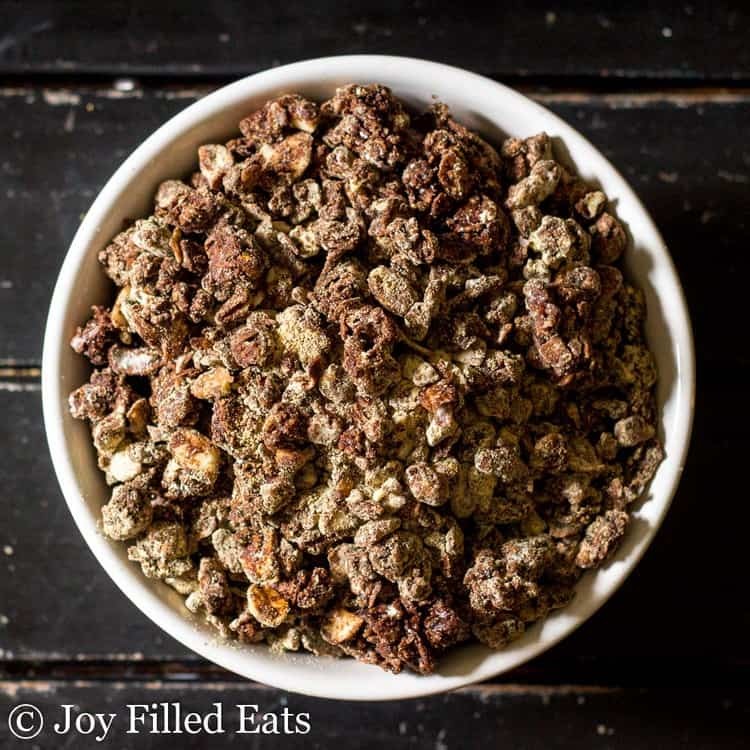 Sprinkle half the topping over the trail mix. Refrigerate until firm. 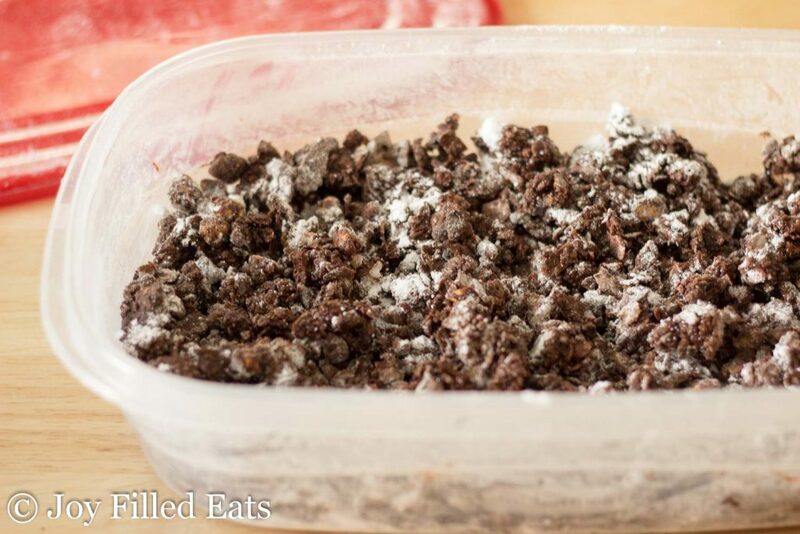 Sprinkle the rest of the topping over the trail mix and mix well. Break up any large pieces. Store in the fridge. Can you use other sweeteners? Yes, any granulated or powdered sweetener should work. If you know which one you'd like to use I can offer conversion tips. CAn someone help me with the sweetener Is there an equivalent sweetener I can buy at a local store rather have to order such a large quantity’s? Truvia measures the same as my sweetener. Oh my! Just made this to share with our extended family during Thanksgiving, but this bag may not survive the 8 hour trip down there. So yummy! I don’t have Gentle Sweet, but I keep homemade Super Sweet on hand. I subbed 4 Tbs powdered SS in the chocolate mixture and another 4 Tbs in the topping mixture. Thanks for sharing this delicious recipe with us! You could probably sub cocoa powder mixed with coconut oil (like skinny chocolate) but I haven't tried it. Just made this recipe! Super yummy! This will make a great treat while camping this weekend. I used half cup of the larger coconut flakes and half cup of the small flakes. I also added in some cocoa nibs for more super food. Thank you for this fun recipe! What is the “topping” you mention? It's in the recipe on this post. I have it written as coating here. Powdered sweetener and peanut butter powder. How well would this do travelling without refrigeration? We're going camping & this would be a great treat to have along but I worry it might just be a greasy mess without a fridge. The chocolate would melt if it's hot but it should be fine to just keep in a cooler. Yes. I've seen similar recipes with pork rinds. I haven't been able to wrap my head around using them in a sweet recipe yet. lol. Yes, just double the nuts or half the other ingredients. Just made my fitst batch! Thanks for the recipe! It keeps in the fridge for a month :) You don't need to freeze it. Can I use 100% cacao unsweetened baking chocolate? Is all I have at the moment! I just made this and it is delishhhhh! I am in love. All of the nuts I used were unsalted except for the peanuts and I noticed I love the peanutty bites the best because of the salty-sweet thing....so I added some salt to the final coating and it's great! Next time I'll probably use my favorite nuts and leave out the ones I'm not as into. So much fun and so tasty!!! It's even better if you toast the coconut until it's light brown and crispy! I've never made it with nuts before but I would toast those, too! What a great idea! I've never heard of this before but it sounds amazing. What a great idea. This looks like the kind of snack I'd eat all by myself. Some things are just too good to share! This looks fantastic!! My kids love muddy Buddies! This is great! I have one teen who won't eat coconut! What would be a great sub - it would you just make it without it altogether? You can just leave it out. Either double the nuts or half the other ingredients. Oooh, great idea. I've made something similar pork rinds before, but the nuts and coconut sound so much better! My kids would love this.